The Commemorative Air Force offered me an assignment to photograph their 2018 Wings Over Dallas WW II Airshow, and I enthusiastically accepted. This event is more than an airshow. It is a living history lesson, featuring not only some of the machines, but also the men and women who served America during World War II. This year's theme was the Allied invasion of Normandy, France--D-Day. The CAF fielded four Douglas C-53 Skytrooper / C-47 Skytrain cargo aircraft, two of which are actual D-day veterans--"That's All Brother" and "D-Day Doll". Paratroopers, many equipped with authentic WW II-era gear, executed airdrops over the field. The National Museum of the Pacific War educated the audience about the war in the pacific by demonstrating some of the weapons and tactics employed. Wings Over Dallas is the perfect opportunity to educate our younger generations about the service and sacrifice of our Greatest Generation. You may click on "Contact Me" to the left to reach me with any questions or requests. 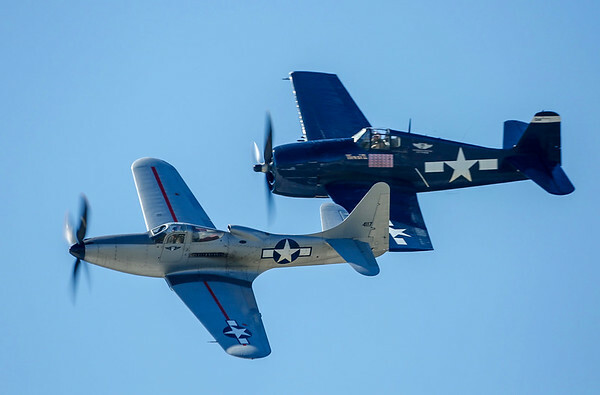 P-63 King Cobra and F6F Hellcat in formation.